Luna Sandals was named the overall winner of the fifth-annual American Made Outdoor Gear Award during a ceremony at the Outdoor Retailer Winter Market in Salt Lake City, UT. Conceptualized and hosted by Kokatat Inc., a U.S. manufacturer of technical apparel and gear for paddle sports, the American Made Outdoor Gear Awards were open to all American manufacturers with a compelling story. Luna Sandals handcrafts its adventure sandals in Seattle, WA. 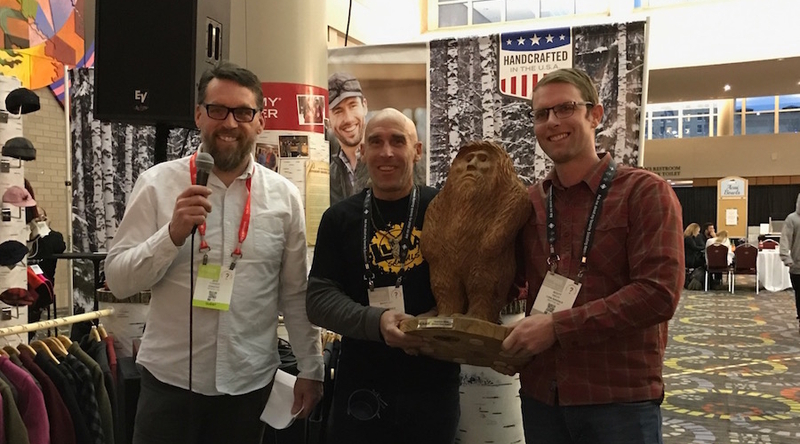 As winners of the American Made Outdoor Gear Award, Luna Sandals will take one-year ownership of the “Sassy” travelling trophy – a two-foot tall, hand carved, redwood Sasquatch from Humboldt County, CA. In addition to the overall winner, awards in several categories based on company size were also given. The category winners received a miniature version of the Sassy award during the Outdoor Retailer Winter Market celebration. Under 10 Employees – Cleverhood of Providence, RI, a cycling cape manufacturer. 10 to 50 Employees – Frost River of Duluth, MN, a bag and durable goods manufacturer. 50-100 Employees – Rock Exotica of Orem, UT, a rock climbing gear manufacturer. 100-plus Employees – Exxel Outdoors of Boulder, CO, an outdoor gear manufacturer. This year’s awards were presented in the Stormy Kromer booth during the Outdoor Retailer Winter Market in Salt Lake City, UT. The statues presented to the winners are hand carved by a local artisan near Kokatat’s headquarters in Arcata, CA.